Boys tend to use physical intimidation or threats, regardless of the gender of their victims. Bullying by girls is more often verbal, usually with another girl as the target. Physical bullying includes hitting, punching, kicking and other types of physical harm, as well as destruction of a child's property. Children who regularly bully their peers tend to be impulsive, easily frustrated, dominant in personality, have difficulty conforming to rules, view violence positively and are more likely to have friends who are also bullies. Boys who bully are usually physically stronger than their peers. Moreover, several risk factors have been associated with bullying, including individual, family, peer, school, and community factors. With respect to family factors, children are more likely to bully if there is a lack of warmth and parent involvement, lack of parental supervision, and harsh corporal discipline. Some research suggests a link between bullying behavior and child maltreatment. Also, schools that lack adequate adult supervision tend to have more instances of bullying. Tell an adult. Many young people fear telling an adult because they don’t want to look like a snitch or seem weak. However, adults can help end the bullying. Also, it may make you feel better to tell an adult. Stand up for yourself. Believe it or not, this will help you gain respect from others. Practice what you might say to a bully with a friend, your mirror, or an adult. Practice saying it in a firm, confident voice. You may even encourage others to protect themselves from bullying, too. Don’t give out personal information online, whether in instant message profiles, chat rooms, blogs, or on Web sites. Don’t tell anyone your e-mail or instant messaging passwords, even your friends. If someone sends a mean or threatening message, don't respond. Save it and show it to a trusted adult. If someone is sending mean messages to you through IM or texts, just log off or shut off your phone. You can also ‘block’ certain people from sending you messages on some Web sites. You can’t be bullied if the bully can’t access you! Stand up for the victim. It takes a lot of courage, but try defending the person being bullied. This can shock and embarrass the bully so much that they leave their victim alone. Don’t join in on bullying. If you see someone being bullied, don’t join in. If the bully tries to get you to help, refuse and walk away. Stop the rumors. Don’t help spread rumors about another person. You wouldn’t want rumors spread about you, so don’t do it to someone else! If someone gossips to you, let it end with you – don’t pass it on to others. You can even tell that person you’re not interested. Offer help. When the bully is gone, try and help the person who was bullied and make sure he or she is okay. Encourage her to talk to an adult and stick up for herself. When you help someone who’s being bullied, you are not just helping someone else, you’re also helping yourself. It’s important to stand up for what you believe in and help others when you can. 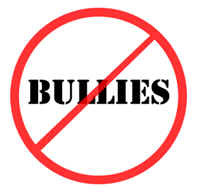 A Bully is not Cool....A Bully is a Fool!